Nothing beats a warming casserole or a dish of stew once winter takes hold. Here are some of my favorite Chinese winter recipes, from spicy soy sauce chicken (red-cooked chicken) to congee and a beef stew with Chinese vegetables. This is an example of red cooking, whereby meat or poultry is simmered in dark soy sauce, imparting a reddish color. Chicken cooked in this method is very juicy, with the meat coming easily off the bone. The rich sauce can be used again the next time you prepare soy sauce chicken or other red-cooked dishes -- over time, the sauce becomes even richer and has a fuller flavor. 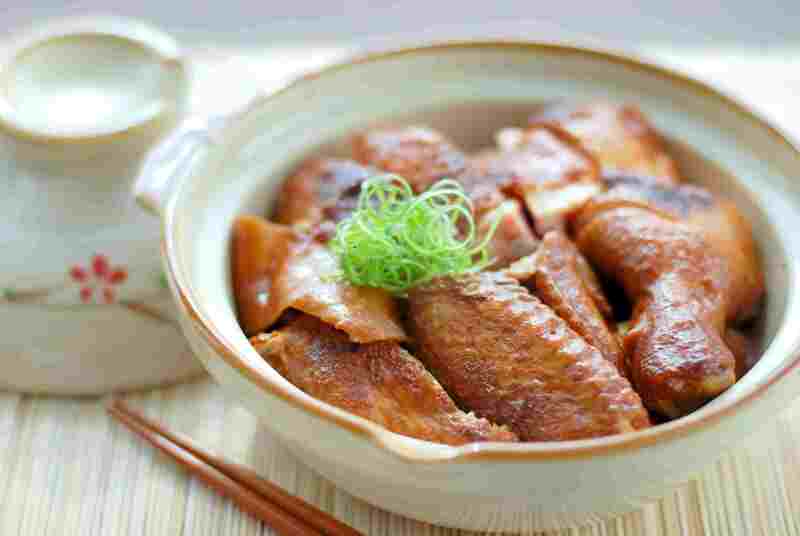 This popular dish found is a staple at many Chinese restaurant buffets. The secret to making Chinese green beans is a cooking technique called "dry-frying" (gan bian); frying the green beans until the skin starts to "pucker" and turn brown. This makes the beans more tender and less crunchy. Congee, also called jook, is the classic Asian breakfast dish. This is a basic recipe for congee that you can add to as desired -- there are several suggestions included in the recipe. This is a famous casserole dish from eastern China, featuring oversized pork meatballs to represent the lion and Chinese greens to represent the lion's mane. Traditionally Lion's Head Meatballs would be cooked in a sand clay pot. In this recipe, the meatballs are made in a wok, but they can also be cooked in a Dutch oven or in a casserole dish in the oven. Mapo Doufu is translated roughly as "pockmarked grandmother beancurd," named for the old woman who supposedly invented the dish. This spicy, aromatic dish is perfect for cold winter days. For a vegetarian version, feel free to leave out the ground pork. Lamb dishes are very popular in northern China. In this recipe leg of lamb is paired with strong flavored garlic and green onion, and seasoned with rice vinegar and Asian sesame oil. Chicken is coated in a flavorful marinade with Worcestershire sauce and oyster sauce, stir-fried with garlic and ginger and then combined with cooked rice. This recipe comes from Remembering Diamond Head, Remembering Hawai'i: A Cookbook Memoir of Hawai'i and Its Foods. The authors write: "Chinese cooks at Hawaiian ranches made stew on an open fire, tossing the less-than-tender beef into a pot of water to simmer all day long, then adding vegetables shortly before the cowboys came in." Stir-fried baby bok choy is combined with steaming rice and Chinese dried mushrooms in this healthy side dish. Mongolian Lamb is a northern Chinese dish marinated in a flavorful sauce composed of soy sauce, sesame oil, red wine vinegar, and chili paste. This healthy one-dish meal is easy to digest, making it a good choice for children and seniors alike. Feel free to load it up with Chinese sausage (lap cheung) or cooked ham.